The idea of the unity of mankind did not come easily to the Greeks. Its eventual emergence has been ascribed to various sources, not least to Alexander the Great. Baldry believes that it cannot be attributed to any single individual, but that the true picture is a long and complicated chain of development to which many contributed. 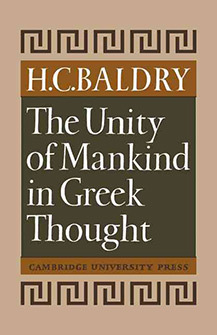 In this book Baldry describes this development from Homer to Cicero when, although the traditional divisions and prejudices still remained string, the idea of unity had become part of the outlook of civilized man. He discusses the contribution of thinkers such as Antiphon, Aristotle, the Cynics or Zeno; the influence of great historical movements like the rise of Macedon and Rome; and also the obstacles that stood in the way - the divisions between Greek and barbarian, free and slave, enlightened and unenlightened, even man and woman. This study will interest not only classical scholars but also historians and philosophers. In particular Baldry’s assessment of the influence of Alexander and the ideas of Zeno is important.